This report, our first for this volcano, covers the low-level activity of Cerro Bravo and monitoring efforts during 2006-2012 based on reporting by the Servicio Geológico Colombiano (SGC). Cerro Bravo was non-eruptive and the Alert Level remained at IV (Green; "volcanically active with stable behavior") due to minimal seismicity, gas emissions, and deformation. Data availability. Government and academic investigations during 1980-1990 established the geology and preliminary hazard analysis for Cerro Bravo. Monthly SGC technical bulletins were available online from March 2006 through December 2012 and documented an increasing diversity of datasets that developed as the monitoring network expanded. Those bulletins highlighted low-level seismicity that was frequently dominated by surficial activity (rockfalls and other mass-wasting events); fluctuations in radon gas emissions were also noted and baseline data was established for emission rates. As of December 2012, three seismometers (two short-period and one triaxial station), one tiltmeter, two EDM leveling lines, and 10 diffuse radon detectors comprised the monitoring effort (figure 1). Figure 1. Location map of Cerro Bravo and the monitoring network maintained by the Servicio Geológico Colombiano (SGC). One seismic station (CAJO) was ~6 km S of the edifice, beyond this map view. The town of Letras (~6 km SW) was the largest community proximal to the volcano. The yellow road crossing the region is Route 50 which continues to Manizales (25 km W of Cerro Bravo) and to Bogota (140 km SE of Cerro Bravo). This map was modified from the original that appeared in the December 2012 Activity Report of the SGC. 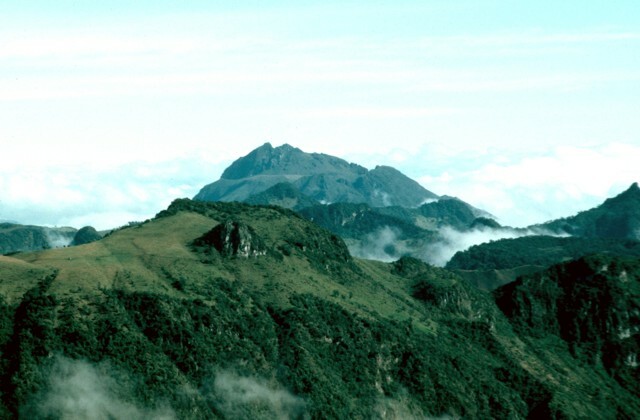 Thouret and others (1990) presented a framework for regional volcanic activity after conducting an assessment of the Ruiz-Tolima Massif (figure 2). The investigators determined that, within a 2 Ma-long period, "recent explosive activity has migrated towards the intersections of the Palestina strike-slip fault and the N 50°W normal faults, first around [the volcanic centers] Quindío and Tolima, secondly in the Cerro Espana area, and most recently close to Cerro Bravo and Ruiz." Holocene activity at Cerro Bravo was characterized as dacitic with evidence of magma mixing. They also highlighted the role of caldera collapse within the region, including the case of Quebrada Seca Caldera, a major bounding feature of Cerro Bravo (figure 3). The concluding remarks included an emphasis on mass wasting at Cerro Bravo and lahar hazards for the ice-clad volcanoes in the region, mainly Nevado del Ruiz and Nevado del Tolima. Figure 2. This map of seven volcanoes includes Cerro Bravo (red triangle) in the far NE region. Fault lines (dashed green lines) cross the area and are labeled with the following abbreviations: P.F.=Palestina Fault; O.-T.-F.=Otun-Pereira Fault; T.F.=Toche Fault; R.-T.F.=Recio-Tolima Fault. The city of Manizales is marked with a blue square in the NE corner. Modified from Thouret and others, 1995. Figure 3. Two views of Cerro Bravo's SW flank from Letras, a town ~6 km SW of the summit. (A) This profile of merged photos was taken in July 2011; note that the youngest domes in the structure comprise the highest peaks on the left-hand side of the photo (northernmost peaks). Courtesy of Maria Luisa Monsalve, SGC. (B) Panorama view of Cerro Bravo annotated with major structural features by Monsalve (1991). A government report prepared by Monsalve (1991) assessed the geology of the area and presented several hazard maps for pyroclastic flow, pyroclastic fall, ballistic projectiles, dome collapse, and lahar scenarios. Although ashfall could reach Manizales (~25 km W), most hazards in this study were centrally located around the immediate region of Cerro Bravo, for example pyroclastic flows and flank failures (figure 4). Hazard zones for lahars included the Río Guarino, Río Aguacatal, and Río Gualí which could extend as far as the town of Honda (~80 km E). Figure 4. This map of hazard zones for Cerro Bravo highlights pyroclastic flow scenarios. The summit of Cerro Bravo is marked with a red star; nearby towns and communities are labeled with green text. Modified from Monsalve (1991). Seismicity during 2006-2012. During this reporting period, seismicity occurred at very low levels with 0-9 volcano-tectonic events (VT) recorded per month (table 1). Long-period earthquakes (LP) occurred more frequently with 0-80 events recorded per month. The SGC noted avalanche and rockfall signatures and, relative to the other years reviewed during this report, 2008 and 2011 had a notable number of surficial seismic signatures attributed to small avalanches and rockfalls. An average of 22 avalanche and 14 rockfall events occurred per month whereas the averages were between 1.5 and 10.7, respectively, during other years. The largest single rockfall event occurred in May 2012 and lasted for 34 seconds. Table 1. Monthly seismicity at Cerro Bravo was tabulated by the occurrence of events: volcano-tectonic (VT), long-period (LP), rockfall, and largest earthquake magnitude. Courtesy of SGC. The largest recorded earthquake magnitude, M 3.4, was recorded in December 2008. The average magnitude during this reporting period was M 1.7. An anomalous 2-hour-long signal was recorded in June 2006; that month, seismicity was slightly elevated (3 VT, 11 LP, and 37 rockfalls). The SGC August 2008 bulletin highlighted a seismic swarm within the region of Cerro Bravo. The swarm was detected on 9 August 2008 comprising 65 earthquakes at an undetermined distance NE of Paramillo del Quindío (located ~40 km S of Cerro Bravo) at relatively shallow depths (2-5 km). The earthquakes had small magnitudes; the largest was M 1.14. A second swarm occurred on 30 December 2008, when ~80 LP earthquakes were detected. The largest event, an M 2.3 earthquake, occurred S of Cerro Bravo and caused shaking that was noted by residents of Manizales (particularly those in tall buildings). A swarm of 67 earthquakes occurred during 17-29 November 2010. The SGC noted that rockfalls and avalanches were likely responsible for these events. That month, there were five LP earthquakes but no VT earthquakes were detected. Rockfalls and avalanches were attributed to elevated seismicity in June 2011 when 40 events were detected that month. While those earthquakes were occurring, there were no associated geophysical or geochemical changes observed at the edifice. Geochemical monitoring efforts. Radon and carbon dioxide data were recorded by the SGC during 2005 through 2012 (figure 5), although CO2 data became unavailable after October 2009. The SGC reported that background level emissions were classified as values 2 data rarely coincided with radon except for a prominent increase around June 2008 at that Cerro Bravo 2 station CO2 measured ~2.7% volume and the radon peak was ~900 pCi/L. Figure 5. Radon and carbon dioxide emissions from Cerro Bravo during April 2005 - May 2010 (Cerro Bravo 1 Station) and June 2005-May 2010 (Cerro Bravo 2 Station). Note that, at both stations, CO2 data ended in October 2009. Courtesy of SGC. Figure 6. This plot of radon emissions for 2005-2012 includes increasingly more radon stations over time. Installation of eight new stations occurred in June 2011 at a time when radon emissions were peaking around 2,000 pCi/L. Courtesy of SGC. Surface deformation monitoring. In October 2009, the SGC installed reflectors and base stations for two EDM (Electronic Distance Measurement) lines (figure 1). An EDM survey was conducted three months later, beginning the establishment of long-term surface deformation monitoring. During 2009-2012, eight EDM surveys were conducted from the El Doce base and four EDM surveys were conducted from El Porton; the SGC stated that no significant changes were calculated from these datasets. Monitoring with an electronic tilt station began in late March 2011 with an installation on the E flank (figure 1). Stable conditions were recorded by the tiltmeter up until December 2011 when decreasing trends suddenly began from both N and E components (figure 7). The SGC noted that from December 2011 to early April 2012 there was a total change of -5 & mu;m and -8 & mu;m (N and E components respectively). During April-December 2012, generally stable conditions resumed. Figure 7. The electronic tilt record from CBRE station (located on the E flank). With the exception of December 2011-April 2012 (when significant decreasing trends persisted), this record showed fluctuations within expected range of the instrument. Courtesy of SGC. References. Lescinsky, D., 1990, Geology, volcanology and petrology of Cerro Bravo, a young dacitic stratovolcano in West-Central Colombia [Master's Thesis]: Hanover, NH, Dartmouth College, 244 pp. Monsalve, M.L., 1991. Mapa preliminar de amenaza volcánica del Volcán Cerro Bravo, INGEOMINAS, Prepared for the Government of Tolima and CRE-Tolima. Thouret, J.C., Cantagrel, J-M., Robin, C., Murcia, A., Salinas, R., and Cepeda, H., 1995, Quaternary eruptive history and hazard-zone model at Nevado del Tolima and Cerro Machin volcanoes, Colombia. Journal of Volcanology Geothermal Research, 66 (1-4):397-426. Thouret, J.C., Murcia, A., Salinas, R., Parra, E., Cepeda, H., and Cantagrel, J-M., Stratigraphy and quaternary eruptive history of the Ruiz-Tolima volcanic massif (Colombia): Implications for assessment of volcanic hazards. Symposium International Géodynamique Andine: Résumés des communications. 15-17 May 1990, Grenoble, France. p. 391-393. Information Contacts: María Luisa Monsalve, Gloria Patricia Cortés, and Cristian Mauricio López, Servicio Geológico Colombiano (SGC), Volcanological and Seismological Observatory, Avenida 12 Octubre 15-47, Manizales, Colombia (URL: https://www2.sgc.gov.co/volcanes/index.html). The Global Volcanism Program has no Weekly Reports available for Cerro Bravo. Cerro Bravo is a relatively low dominantly dacitic lava-dome complex north of Nevado del Ruiz that was constructed within the Pleistocene Quebrada Seca caldera. A series of moderate plinian eruptions during the Holocene were accompanied by pyroclastic flows and lava dome growth. Although historical records of the roughly 4000-m-high Cerro Bravo eruptions have not been found, stratigraphic evidence indicates that it last erupted sometime between the 1595 and 1845 eruptions of Ruiz. Cuellar-Rodriguez J V, Ramirez-Lopez C, 1987. Descripcion de los volcanes Colombianos. Rev CIAF, Bogota, p 189-222. Herd D G, 1982. Glacial and volcanic geology of the Ruiz - Tolima volcanic complex Cordillera Central, Colombia. Pub Geol Especiales INGEOMINAS, Bogata, 8: 1-48. Lescinsky D T, 1990. 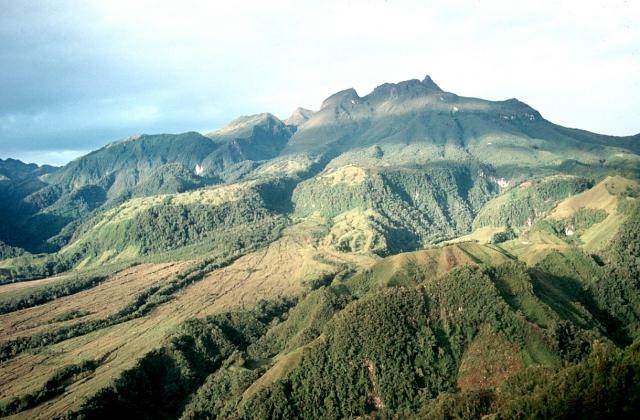 Geology, volcanology, and petrology of Cerro Bravo, a young, dacitic stratovolcano in west-central Colombia. Unpublished Master's thesis, Lousiana State Univ, 244 p.
Mendez Fajury R A, 1989. Catalogo de los volcanes activos en Colombia. Bol Geol INGEOMINAS, Colombia, 30: 1-75. There is data available for 8 Holocene eruptive periods. There is no Deformation History data available for Cerro Bravo. There is no Emissions History data available for Cerro Bravo. Cerro Bravo is seen from Delgaditas on its east side. The summit dome with a prominent spine was extruded during the most recent eruption. An older lava dome and cone complex is situated to its left. Multiple collapse events sent block-and-ash flows down over viscous lava flows (center) and onto the Plan de Arriba (lower left). The low, tree-covered slope 1/4 of the way from the left side of the photo is the remnant of the pre-Cerro Bravo volcano that was destroyed by a Pleistocene caldera-forming event. Photo by David Lescinsky, 1988 (University of Western Ontario). Cerro Bravo volcano, Colombia, is seen to the north from the northern flank of Nevado del Ruiz. The CB1 summit dome rises above an older dome and cone complex, probably produced during the CB7-CB5 phase of activity. Below this, the remains of the pre-Cerro Bravo volcano are truncated by the Pleistocene Quebrada Seca Caldera. Most of the Pleistocene lava flows in the foreground are associated with Nevado del Ruiz. There are no samples for Cerro Bravo in the Smithsonian's NMNH Department of Mineral Sciences Rock and Ore collection. Large Eruptions of Cerro Bravo Information about large Quaternary eruptions (VEI >= 4) is cataloged in the Large Magnitude Explosive Volcanic Eruptions (LaMEVE) database of the Volcano Global Risk Identification and Analysis Project (VOGRIPA).